Gaven Industries' R.F. 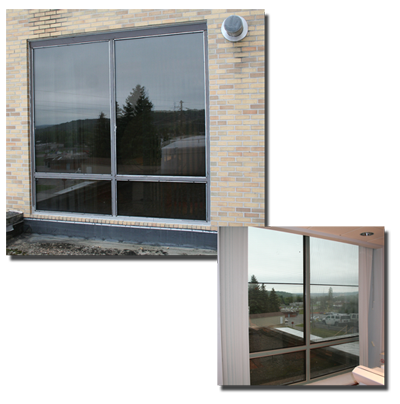 Shielded View Windows are factory assembled units consisting of a stainless steel tube frame, stainless steel screen frame, two layers of brass screen, and two layers of 1/4" tempered glass. The two layers of R.F. screen are offset in order to prevent the Moiré effect and also blackened to achieve maximum visibility. Other than the painted finish of the frame there is no other work required of the contractor or owner. Gaven Industries' View Windows can be fabricated to almost any size and/or configuration to fit the requirements of your project. Our R.F. 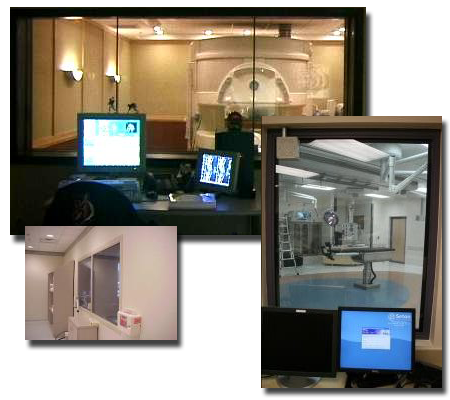 Shielded View Windows meet or exceed all current MRI manufacturer specifications. They also exceed the shielding requirements of MIL-STD-73-2A. Gaven Industries' R.F. Shielded Exterior Windows are an ideal choice if access is required through an outside wall for the egress of equipment such as an MRI. The Window can be removed without disturbing the surrounding building structure. The frame is made of 304 stainless steel, is thermally broken, and fully insulated. The two layers of R.F. screen are offset in order to prevent the Moiré effect and also blackened to achieve maximum visibility. One piece fully welded window frames up to 10' long can be fabricated and installed. It only requires painting to match the other exterior windows used in the project. Any of today's thermal glass units up to 1" thick can be used. Our R.F. Shielded Exterior Windows meet or exceed all current MRI manufacturer specifications. They also exceed the shielding requirements of MIL-STD-73-2A. Gaven Industries' R.F. Shielded Skylight Windows are an ideal choice if access is required through the roof for the egress of equipment such as an MRI. The Skylight can be removed without disturbing the surrounding building structure. Our Skylights are factory fabricated units consisting of a stainless steel tube frame, stainless steel screen frame, two layers of brass screen, and two layers of 1/4" thick transparent acrylic sheet. The two layers of R.F. screen are offset in order to prevent the Moiré effect and also blackened to achieve maximum visibility. R.F. Skylights can either match the exact profile of a new or existing exterior Skylight or be a single Thermally broken Skylight employing any of today's thermal glass units up to 1" thick. Gaven Industries' R.F. Shielded Skylights can be fabricated to almost any size and / or configuration. Our R.F. 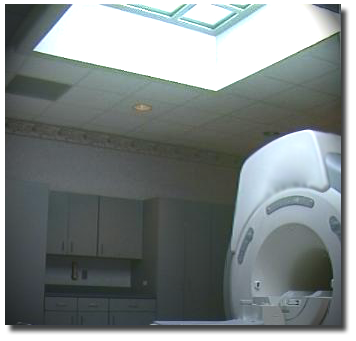 Shielded Skylights meet or exceed all current MRI manufacturer specifications. They also exceed the shielding requirements of MIL-STD-73-2A.